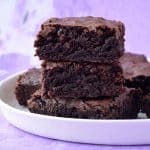 Fudgy Olive Oil Brownies that are also dairy free. Preheat oven to 180 C (360 F). Line an 8 inch square baking tin with baking or parchment paper. In a large mixing bowl, add olive oil, vanilla and sugars and mix briefly. In a separate bowl, add eggs and whisk with a fork for approximately 30 seconds or until combined. Add eggs to sugar mixture, along with cocoa powder, flour and chocolate chips. Gently mix with a spoon or spatula to combine. Pour into prepared tin. Bake for approximately 28-30 minutes or until a knife inserted in the middle comes out clean. Leave to cool slightly before removing from pan. They will firm up as they cool. Serve with ice cream or cream. *Use dairy free chocolate chips if you want to make this recipe dairy free. To serve the next day, warm brownie in the microwave for 10-15 seconds.